Soho Crime all-star John Straley is the author of ten novels, including Cold Storage, Alaska, and The Woman Who Married a Bear. 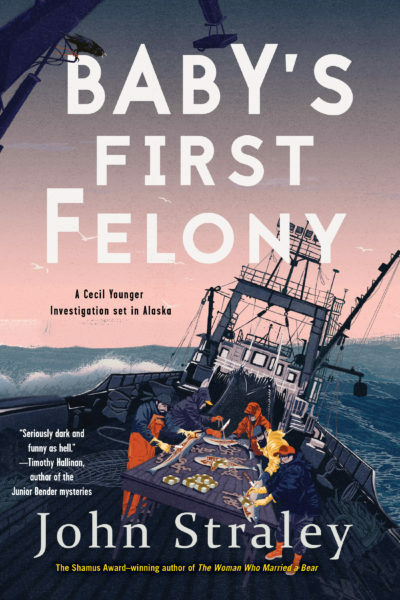 A former criminal defense investigator, Straley lives in Sitka, Alaska, which is the setting for his wry, incisive, and deeply exciting Cecil Younger Investigations series. Soho Crime is re-releasing the seven books in this series in newly-designed covers this summer. Check out all of the titles here. 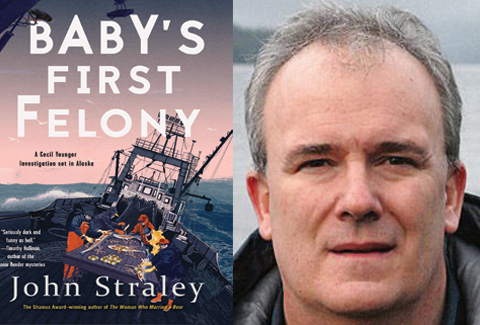 Straley’s next novel, Baby’s First Felony, earned a starred review from Publishers Weekly, and will be released in early July. In advance of its publication, we asked the author to share some information about the book and its inception with our readers. Enjoy. 1. What’s your new book about? Baby’s First Felony brings back Private Detective Cecil Younger, from a series that started in 1993 with The Woman Who Married a Bear. In this new novel Cecil is giving an allocution in front of a three-judge panel asking for his sentence to be reduced. He tells them the story of how he murdered a man in prison after freeing his and Jane Marie’s kidnapped daughter, and destroying a local hotel with the help of a group of his clients at the public defender agency using nothing but rain water and a few poorly chosen explosives. 2. What attracted you to the idea/concept of the book? I spent close to thirty years working as a criminal defense investigator in Alaska. This novel collects some of my greatest fears of what could happen if everything went wrong all at once. I wanted to pay respect to the people I worked with and at the same time I wanted to show the wild mistakes people make when their lives start spinning out of control. So, I had my detective start making all the same mistakes that he advises everyone against making. Everyone likes to think they will be smart and calm when things go wrong, but from experience, I don’t think that is true. 3. What kind of research was required? On-the-job experience, plus I asked my boss, who is now a judge, to write the decision that appears at the end of the book. 4. Which books or authors influenced you while writing this book? Here are some of the books I read while working on Baby’s First Felony. Now did these writers influence me? I’m sure they did but I’m not sure how. To The Bright Edge of the World by Eowyn Ivey, Swann’s Way by Marcel Proust, Lean on Pete by Willy Vlautin, Ghost Work by Roger Hobbs, and The Bible (third time through beginning to end). Come to think of it, I’m sure Roger Hobbs made me pay attention to pacing, and to true crime detail. Vlautin made me pay attention to compassion for people with hard lives. The Bible makes me wish I were tougher. Eowyn Ivey and Marcel Proust made me wish I were smarter and harder working respectively. 5. Did anything not make it into the book that readers might find surprising or interesting? “Don’t step in dog poop as you climb into your neighbors window to burgle the house, then track poop all through the house and then back into your house and leave your poopy shoes under your own bed for the cops to find. Or more details to the “Do not wear the stolen shoes to Court . . .” which included the incident when the “complaining witness describes from the stand, under oath, what was stolen from his house and he gets to the sneakers that were taken, and he leans over and says, “They were EXACTLY like the ones the defendant is wearing right now.” A break was requested while the police got a warrant and got the shoes, which in fact had the NAME OF THE COMPLAINING WITNESS still written in ink inside of them. This incident, which actually happened to a public defender client in southeastern Alaska, actually became semi-famous and made it onto a nice man’s national radio program. 6. When readers finish the book, what do you hope they will think and feel? I hope they will know the Defense Investigator’s Four Noble Truths in their bones: 1) Nothing good ever comes from using methamphetamine. 2) Reality is always, always more complicated than our ability to plan for it. 3) When accused of a serious felony, always have an attorney with criminal law experience with you when you talk with the police, and 4) Reread number three, because even though you don’t think it applies to you, it does.